The closed crowd tries to set and create its own limited space; the space it will fill is assigned. It is comparable to a container whose capacity is known into which liquid is poured. They are only few access points to this space are numbered and you cannot enter it in any which way. The Nazis liked to imagine the Communists, however, as a chaotic and irregular “open crowd”, with the implicit threat of unstoppable growth. This is how they would portray Communists in their films. Over and above the Bolshevik chaos, Nazism proposed the closed order of the domesticated masses. The fascination we feel when we see those images of disturbing geometric beauty, the strange giddiness of knowing that each of those dots is a human being like ourselves, makes us overlook a series of reflections of a more rational nature. For example, and sticking to Canetti observation that “they are only few access points to this space”, that is, to the closed crowd: Have you ever stopped to think how such human agglomerations were technically organized? Each group has a “parade plan” with the time of the first meeting, the exact route of the parade, the place and time of meeting with other groups… So it is for the breaking up of this huge circus of two million people. There was no jam, but like everything in life has a price, the price to pay for an incident free radial parade toward Tempelhof was that it lasted from seven in the morning until one in the afternoon. At that time the place was completely covered, but the speeches were not going to start until four. For civilians, waiting at least three hours under unbearable heat without being able to sit on the floor is not without its problem, especially when one does not expect a special show, but only a series of speeches. Well, at this point, are you thinking what I’m thinking? Indeed, when you have to train for hours in the rigid structure of a “closed crowd”… What do you do if you have to go to the bathroom? The organization had miscalculated the number of toilets. Or maybe it forgot all of them. In addition, the columns of unionists were squeezed between the SA and the SS, so that it would be impossible for them to leave; on the other hand, the organizers would have prevented any such attempt. The night before, many celebrated discreetly the farewell: farewell to union, party, socialism… And they did this with beer and schnapps, in their favourite bars. The thing is that the consequences were beginning to show. The shivering participants in the celebration were unable to contain their physiological need to urinate, so they wet their pants and marching boots under the sound of drums, trumpets and flutes….Sieg Heil! …Heil Hitler! The next day, by the way, on May 2, 1933, free labor unions ceased to exist in Germany. The monotony and monochrome image of the mass is interrupted by twelve or sixteen gigantic tents with the fluttering flag of the Red Cross. They form a checker board pattern alternated with the towering concrete toilets, which recall bunkers of Verdun. This image confirms that man does not live by the word. Neither of the first aid centers are decorated. Apparently, more than 4,000 people needed medical assistance. From what I could find out, about a thousand people, by falling unconscious, suffered broken arms or legs, especially on the wrists and ankles. And according to what I have been told, in the camp of Tempelhof six or, according to others, nine babies came into the world. Naturally, most emergencies were due to fainting caused by heat. 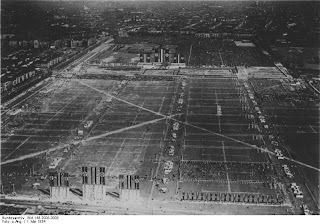 Sobanski, however, refers to civilians who came to Tempelhof as spectators. They were a relatively “open” mass, drawing on canettiana terminology. Perhaps, though with great effort, civilians could escape the build up. But what about the thousands of uniformed “closed crowd” that had to keep the line for hours? 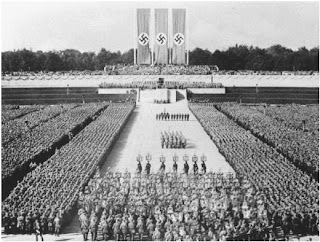 I don’t know about you, but I am no longer able to see pictures of the striking geometry of Adolf Hitler “closed crowd” without imagining what pictures cannot show: a revolting smell of sweat and urine. Quite a symbol, it seems to me. This entry was posted in Nazism and tagged Antoni Sobanski, crowds and power, Elias Canetti, Franz Jung, Leni Riefenstahl, masses, nazism, Reichstag fire, Tempelhof. Bookmark the permalink.